Caroline Fraser is the kind of girl who turns heads and sets tongues wagging. Attractive, bright and vivacious, she seems too exotic a bird to be working as a secretary in the Perth office of Macandon Industries. She arouses strong feelings in everyone who knows her: from Brian, her rejected boyfriend.. to her brother Marco, obsessed with his sister. Even Mac, one of the partners, is taking more than a paternal interest in her, to the fury of Aileen Farquar., the other secretary in the office. This uneasy set of relationships is shattered by a brutal murder. Inspector Doug Niven takes on the case, but when his prime suspect becomes the victim of another gruesome killing, Doug turns to Dr Jean Montrose, the 'wee doc' who has helped him with previous cases. Jean, busy with her lively family, her bustling practice, and her feisty old mother, doesn't want to get involved, but certain aspects draw her reluctantly into the case. Once again Jean's expert medical knowledge and understanding of human nature unravel the deadly web of greed and deceit. 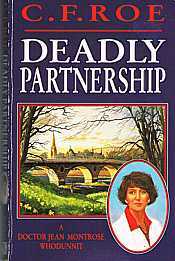 The alternative name of this novel is "A bonny case of murder "